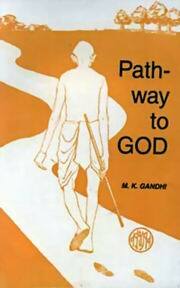 May this Pathway to God inspire young men throughout the world to lead the Life of Light practised and preached by Gandhiji, so that our "Light of India" might soon become the "Light of the World". The extracts from Gandhiji's speeches and writings that Shri M. S. Despande has collected with such diligence and dedication will help young people in India and elsewhere to find the ballast that will give steadiness to their lives and the purpose which will make it a Pathway to God. I have pleasure in commending this Voice of Gandhiji to the youth of India.